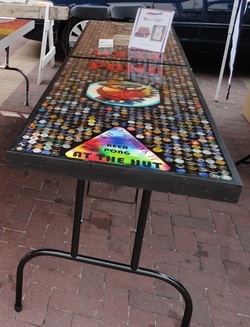 The table pictured above was featured in the Get Glazed booth at Salisbury Pride Saturday June 25th. It was raffled off and the proceeds were donated to Salisbury PFLAG. The table to the left is my personal beer pong table. It contains 1,295 beer caps of many different types of beer. Wooden letters at the top of each side spell Beer Pong and the custom made rack says "We sink it, You drink it". And of course everything is covered with glaze! Looking for a cool beer pong table? Well, you found the right site! We make custom beer pong tables. Just about whatever you want we can put on a table. From beer caps to team logos we have you covered. All the materials on the table are encased in a glaze coat that protects the items on the table and looks really cool. The tables themselves are hand crafted with wood and are made in two 2x4 sides that latch together for easy storage. The legs on most tables fold so the table is free standing when opened. Contact us today to begin design on your custom Beer Pong Table! We have more to come...so check back with us soon!